Arizona Cowboy College™ is a family owned and operated business located in Scottsdale, Arizona, "The West's Most Western Town". 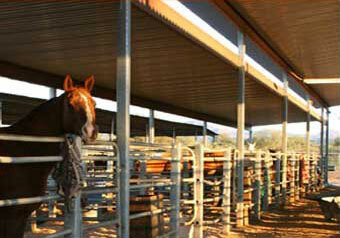 We have been in operation in Scottsdale since 1969 and ran the first session of the "Cowboy College" in 1989. The College is run by Lori Bridwell, wife of the late Lloyd Bridwell the world's most recognized "Working Ranch Cowboy who died tragically in April of 2000." The school senior instructor is now Rocco Wachman, famous for his role in Country Music Television's Original Series Cowboy U 2003, Cowboy U 2004 and Cowboy U Molokai. Lloyd and Rocco worked tirelessly since 1989 on the curriculum and subject matter that makes the Arizona Cowboy College not just another dude ride and the reason it was clear that Rocco was the only choice for Cowboy U. It did not take long for the popularity of the school to take hold. The Arizona Cowboy College has been featured on the NBC's Today Show, CBS Sunday Morning, ABC's Good Morning America and they all agree that this is the only school of it's kind in the world. We have people from across the United States and from all over the world who come to Arizona for an opportunity to learn the skills needed to be successful working on a ranch. Rocco and the College's horses have a unique talent for teaching. He and his staff can take a person who has never touched a horse before and have them riding like the wind just a few days later. We have yet to have one student who did not feel the class was one of the most exciting things they have ever done. Our courses are designed to be a serious attempt at teaching you horsemanship skills and ranching techniques you will carry with you the rest of your life. We have in the last fifteen years found that student after student is amazed at how the Arizona Cowboy College can be a "Life changing experience." Thank you for joining us at our web site. We look forward to riding, roping with you at the Arizona Cowboy College. 9. American Cowboy Magazine - 2011, "Cowboy U", a reality based series about city peoople having to become Working Ranch Cowboys. Staring Rocco, the head instructor at the Arizona Cowboy College. 15. Country Music Television (CMT) Cowboy U Series - 2003 to 2007, "Cowboy U", a reality based series about city peoople having to become Working Ranch Cowboys. Staring Rocco, the head instructor at the Arizona Cowboy College. 17. Arizona Repulbic Newspaper - 2003, "Grindstone Cowboy" & "Roping a Dream"
21. Brentwood Magazine - 2002, "Ranch Dressing"
22. Scottsdale Life Magazine - 2002,"Learning the Ropes"
23. New York's Newday Newspaper- 2001, "Cowboy College for Amateurs"
16. CBS Sunday Morning - 2001, "So You Say You Want To Be A Cowboy"
17. The Valley Guide Winter - 2001, "Out on the Range"
23. Phoenix Magazine - 2000 (front page), "Punchin Cattle at Arizona Cowboy College"
27. Cowboys and Country - 1999, "The Cowboy Way"
29. Horzu (German) Magazine - 1999, "Pratikant im Wilden Westen"
30. Cowboys and Indians Magazine - 1999 & 2000, Open Range Cowboy College"
31. The Christian Science Monitor - 1999, "Life on the Open Range"
32. CDS Television Magazine "EXTRA" - 1998, "I want to be a Cowboy!" 33. People Magazine - 1998, "Homework on the Range"
34. Horse Illustrated "The Magazine for Responsible Horse Owners" - 1998, "Cowboy Class"
35. ABC Good Morning America - 1998, Five minute piece on Lloyd Bridwell and ABC correspondent John Smith attempt at roping and tying a calf. 36. Diversion Magazine for Physicians at Leisure - 1998 (front cover), "My Week at Cowboy College"
37. San Jose Mecury News - 1998 (front page), "Learning the Ropes: Tenderfott Saddles Up For Cowboy College"
38. NBC Today Show - 1998, Seven minute piece on Lloyd Bridwell and NBC correspondent Mike Thacther attempt at attending the college. 39. The Los Angeles Times - 1998 (front page), Arizona "Poke Takes Tenderfoot Students on Horsepower Primer". Story also ran by the Denver Post, Boston Herald, Cape Cod Courier, Rapid City Newspaper and the Baltimore Sun. 40. Fox 10 News "Premier Show" - 1997, "Attending Cowboy College"
41. Jay Leno "The Tonight Show" - 1997, (Opening Monologue) "Say did you hear about the Cowboy college out in Arizona? What in the world do you do with that degree? I don't know anything about computers but I know a lot about a cow." 42. Men's Health Magazine - 1997, "Best New Sports School"
43. Arizona Highways Magazine - 1996, "A School for Cowhands RIDIN', ROPIN', ANAD ROUNDUP"
44. New Times "The Best of Phoenix" - 1995, "Best Place to Learn to be a Cowboy, Arizona Cowboy College"